Demonstration of how to fix two holes in an aluminum air conditioning tube with Super Alloy 5 rod and flux. One of the holes has not been cleaned before soldering or brazing. The aluminum filler rod is as strong as a weld and flows like silver solder. We used a propane torch on the aluminum tubing–at half the melting point of the parent metal. Always keep your torch perpendicular or straight away from the repair area. Wait for your flux to do its job, as it will clean the aluminum dirt, oil, grease, paint, while removing the oxidation, and open the pores of the white metal. 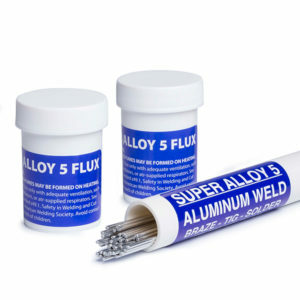 Super Alloy 5 works on cast aluminum as well but you would need to use an oxy acetylene torch to repair cast aluminum or thick/larger sized aluminum.